Educators from Title I schools and programs will pick up free books on Sept. 6 for the Pennsylvania Convention Center’s Big Book Giveaway. 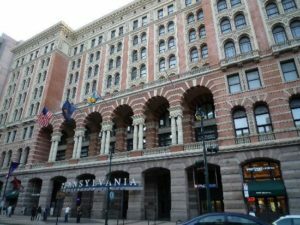 In honor of their 25th anniversaries, the Pennsylvania Convention Center Authority (PCCA) and the Washington, D.C.-based nonprofit social enterprise First Book are teaming up with Philadelphia-area hospitality partners to donate 40,000 brand-new books to programs serving children from low-income families in Southeastern Pennsylvania. PCCA Vice Chair Heather A. Steinmiller championed bringing First Book to the Philadelphia region with the goal of helping to eliminate one of the many hurdles to learning – access to books. Up to 300 educators and program directors, who are registering in advance, will receive 100 to 150 free books for children in preschool programs through high school. The books will be distributed directly to the educators through the efforts of more than 100 volunteers from across Philadelphia. Those involved in the project include Gregory J. Fox, Esq., Chairman, PCCA; Heather A. Steinmiller, Esq., Vice Chair, PCCA; John J. McNichol, President & CEO, PCCA; Anna Anderson, Senior Director, Strategic Alliances, First Book; and educators from schools and children’s programs across Southeastern Pennsylvania. The community effort is possible through the generous efforts of PCCA’s hospitality partners including Aramark Corp., Elliott-Lewis Corp., International Alliance of Theatrical Stage Employees (Local 8), International Brotherhood of Electrical Workers (Local 98), International Association of Bridge, Structural, Ornamental and Reinforcing Iron Workers (Local 405), Laborers’ District Council of the Metropolitan Area of Philadelphia and Vicinity L.I.U.N.A., Laborers International Union of N.A. (Local 332), and facility manager SMG. First Book transforms the lives of children in need. Through a sustainable, market-driven model, First Book is creating equal access to quality education – making everything from brand-new, high-quality books and educational resources, to sports equipment, winter coats, snacks, and more – affordable to its member network of more than 375,000 educators who exclusively serve kids in need. Since 1992, First Book has distributed more than 175 million books and educational resources to programs and schools serving children from low-income families in more than 30 countries. Eligible educators, librarians, providers, and others serving children in need can sign up at firstbook.org/register. For more information, please visit firstbook.org.